To combat the inertia threatening to lock me in a culinary bell jar, I’ve been rereading an old stack of the now defunct Gourmet Magazine. Looking for a flavor, an ingredient, a style I’d forgotten about, anything really. 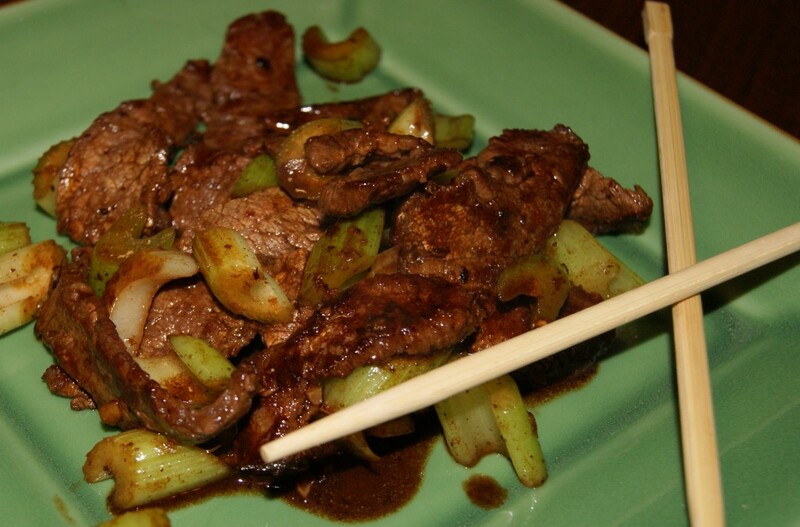 I stumbled across a 2008 recipe for cumin-scented stir fried beef with celery. The recipe looked intriguing and surprisingly quick to prepare. I’ve never stir fried flank steak before, but I loved the way this turned out and will never again purchase they mystery grocery stir-fry cut. I made only minor changes to the original recipe based on what ingredients I had on hand. Never be afraid to make little changes! If you wait to have everything on hand, you can never be spontaneous. Though, I just realized my math was off when I was adjusting quantities so I halved all the seasonings. Anyhow, this is how I prepared it, and we thought it was great. If you’re cooking for children or my mother, you should probably half the amount of crushed red pepper shown below. Otherwise when eaten with rice, I would call it only mildly spicy. L.E. loved it, but Q was wary (spicy), so use your best judgement. Slice the flank steak in half following the grain. Slice flank steak against the grain into slices about 1/8th of an inch thick. Place beef slices in a bowl and stir with 1/2 teaspoon soy sauce, 1/4 tsp cornstarch, and a pinch (really just a pinch – this will be plenty salty!) of kosher salt. In a separate bowl combine remaining 2 teaspoons of soy sauce, 1/4 teaspoon cornstarch, and sake. Heat a heavy bottomed skillet over high heat until it is very hot. Add 1 tbsp of grapeseed oil, then swirl to coat skillet evenly. Cook half of the beef slices – making sure to lay slices flat in only one layer. Test one slice after about 30 seconds and flip if browned. Transfer to a plate when browned – flank steak slices will cook for a total of just about 1 minute. Add remaining teaspoon of grapeseed oil and repeat with second batch. Set cooked flank steak aside. Turn off the heat on the skillet. Add 3-4 heavy shakes of the ground ginger. This will smell very pungent – to the point where you’ll wonder if you’ve over done it, but fear not. Add garlic, cumin, and red pepper flakes, then return heat to almost high and stir fry for about 15 seconds. Add the celery and stir fry for 1 minute. Add back reserved beef and and accumulated juices; stir. Stir reserved soy/sake mixture, then add to skillet and stir. Stir-fry all together about a minute longer, then serve.